Weeze Airport is easily reached by train from many cities including Düsseldorf, Cologne, Duisburg, Essen, Dortmund, Mönchengladbach, Aachen, Krefeld, Kleve, and Venlo (Netherlands). 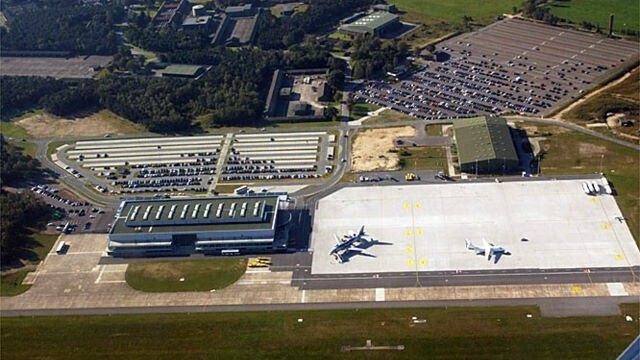 Weeze Airport (NRN) is not directly linked to the German railway network. However, it is possible to get by train to within a ten-minute bus ride from Flughafen Weeze. Weeze and Kevelaer are the closest Deutsche Bahn (DB) train stations to the airport with shuttle buses providing transportation between the stations and airport terminal. Buses from Weeze Airport often are cheaper for individual travelers although small groups may save by using the Schöner-Tag-Ticket NRW from the airport – see details below. Passengers using Deutsche Bahn trains to Weeze Airport should transfer to airport shuttle buses at Weeze or Kevelaer station. Although Kevelaer is the larger station, all trains stop at both Kevelaer and Weeze making the shorter and cheaper bus ride from Weeze station to Weeze Airport the better option for most travelers. (Buses to Kevelaer are often the only option early morning or late night.) A taxi to Weeze station should take only five minutes. The various Schöner Tag Ticket NRW is valid on these buses but cannot be bought on the bus, so buy it online in advance or from a ticket vending machine. Stadtlinie Weeze 1 (SW1) usually runs hourly between Weeze Bahnhof and Weeze Airport terminal building. The ride takes only ten minutes and cost €2.70 (€1.60 for children 6 to 14). Tickets available from the driver in euro cash only. First buses depart from Weeze station at 06:50 and last buses of the day are at 9:20 pm. First buses to Weeze station from the airport leave around 7 am and last buses just before 10 pm. The bus timetable is well coordinated with train departures and arrivals. The Airport Shuttle bus connects Kevelaer Bahnhof and Weeze Airport hourly in around 20 minutes. The one-way fare is €5.90 (€1.60 for children 6 to 14). Tickets available from the driver in euro cash only. Weeze and Kevelaer stations are on the Nordwestbahn (NWB) line of German Railways. Regional Express (RE10) trains operate twice hourly from Kleve via Weeze and Kevelaer to Krefeld and Düsseldorf. However, the connecting airport shuttle buses run only once per hour. Traveling time from Weeze station to Düsseldorf Hauptbahnhof is 1h07 and to Krefeld Hauptbahnhof 40 minutes. (Traveling time from Kevelaer is 5 minutes less.) Weeze to Kleve is 20 minutes. Trains depart from Weeze station to Düsseldorf from 04:45 am on weekdays (05:45 on Saturday and 06:45 on Sundays) to 22:45. Trains arrive at Weeze station from 05:39 on weekdays (06:09 on Saturday and 07:09 on Sunday) to just after midnight. Check the timetables for buses and trains from Weeze Airport online at Deutsche Bahn (German Railways) for departures from from Airport Terminal, Weeze or journeys to Weeze Airport. Düsseldorf Hauptbahnhof has great connections to all parts of Germany but for many travelers from Weeze Airport the most convenient connections are at Krefeld Hbf. Change at Krefeld main station for trains to Venlo and Maastricht in the Netherlands as well as Aachen, Mönchengladbach, Köln (Cologne), Bonn, Duisburg, Essen, Bochum, and Dortmund. For some of the cities listed above, connections are available for Inter-City (IC) and Intern-City-Express (ICE) trains but the Schöner-Tag-Ticket NRW is not valid on these trains. The traveling times on the IC and ICE trains are hardly faster than the regional trains and in some cases even slower. Bus services are also available from Weeze Airport to many of these cities in Germany (Düsseldorf , Duisburg) and the Netherlands and may be faster and cheaper than the standard train fare. The cheapest way to transfer from Weeze Airport (NRN) and Düsseldorf Airport (DUS) is by train. Take the train as described above from Weeze Airport to Düsseldorf Hauptbahnhof and then transfer to a train for Düsseldorf Airport. The total traveling time is around 1h50. A pre-booked private transfer will probably cost around €160 per car and more for a minibus van – Taxi2Airport and Suntransfers give online quotations. The ticket price from Weeze Airport (NRN) including bus fare to Weeze station is around €15 to Düsseldorf and €10 to Krefeld. As both bus and train are covered by Deutsche Bahn fares, special savings fares may be applied, including the bargain Schöner-Tag-Ticket NRW. The Schöner-Tag-Ticket NRW is a good deal if further journeys are planned in the state North Rhine Westphalia. It is valid after 9 am on weekdays (all day on weekends) until 3 am the following morning. For individuals the ticket is €30.50 but groups of up to five may travel for €45. Three travel cheaper on this ticket to Düsseldorf and two can easily make it work if further bus connections are used. The Schöner-Tag-Ticket NRW is only valid on local trains and on most city buses and trams (including in Düsseldorf and Cologne). The ticket may be used for travel throughout North Rhine Westphalia as well as to Venlo (Netherlands) and Osnabrück (Lower Saxony). Tick the “only local transport” option on the Deutsche Bahn Website when searching trains on which this saving ticket is valid, or select the North Rhine Westphalia option at the Day Ticket for Germany page.